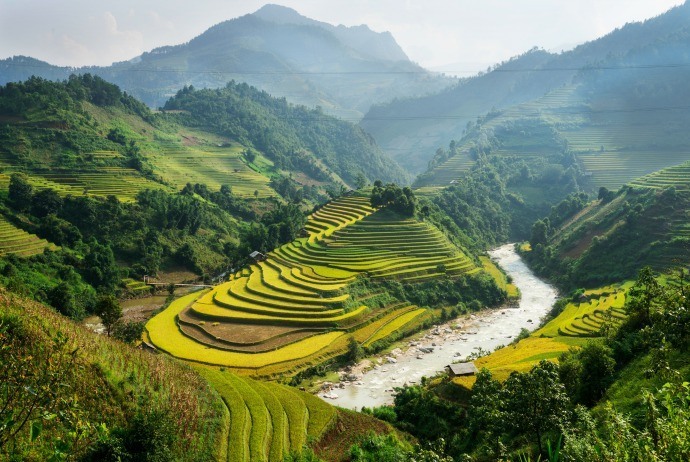 Vietnam has become renowned for its landscapes with beautiful sceneries, welcoming, friendly people, rich culture and fine food, yet is less well-known as a destination for trekkers and walkers. 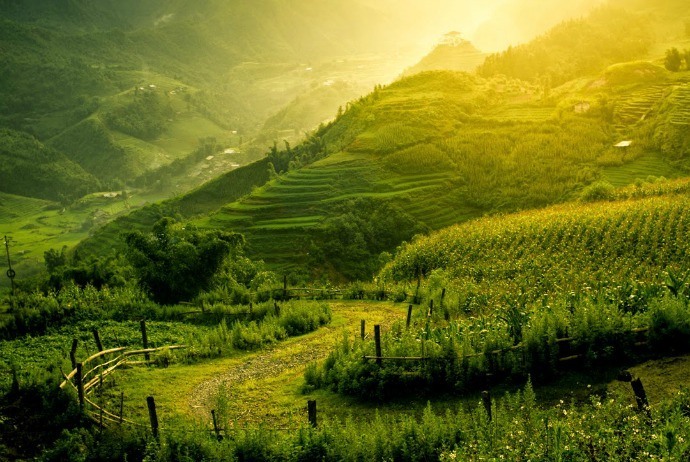 Nonetheless, in the remote areas of northern Vietnam, which are close to the borders with Laos and China, there are many chances for trekking. In reality, Vietnam (Việt Nam) has great trekking and less strenuous walks. Here, you will find remarkable sceneries, including plunging highland valleys, rice paddies, and enormous limestone mountains. In Vietnam, everything about trekking is possible, from half-day hikes to the assaults on the highest mountain of Vietnam – lofty Fansipan. In general, the northern area of Vietnam is the best area of hiking: Its fascinating minority culture and dramatic mountainous paths are big draws. Besides, national parks along with nature reserves are ideal places for trekking in Vietnam. Tourists coming to this S-shaped country are usually mesmerized by the beautiful nature, from golden terraces in harvesting season in the north to central highland or attractive bustles of Mekong Delta in the south. In Vietnam, the most popular types of trekking, hiking are mountain hiking, jungle trekking, countryside hitch-hiking, rambling adventures, and walking. The following list will reveal to you top renowned trekking areas in Vietnam, voted by both domestic and international tourists. This is the frontier town of the province of Lao Cai, located in the northwest area of Vietnam. Considered as the best trekking area in Vietnam, Sapa has the famous mountain, named Fansipan, which is at the height of 3143m and also the highest peak of Vietnam as well as Indochina peninsula. In addition to the mountainous terrain, the town of Sapa is also a spot where some ethnic minorities like Dao, Hmong, Pho Lu, Giay (Giáy), and Tay (Tày) reside. Phu Luong Nature Reserve is one of the highly recommended areas for trekking in Vietnam. Also, it is the newest park in Vietnam. It has outstanding splendor, high biodiversity value, and cultural interest, located in Thanh Hoa (Thanh Hoá) province. This reserve is situated along two parallel mountain ridges, stretching from the northwest to southwest and being split by the central valley. Having rich forest, magnificent rice paddies, limestone panoramas and breathtaking sceneries, Phu Luong is one of the most famous areas for trekking in Vietnam. 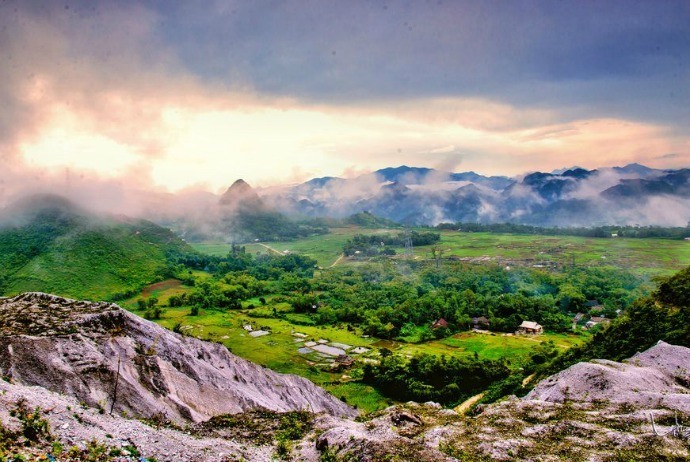 About 135 kilometers far from the capital of Hanoi (Hà Nội), Mai Chau is a favorite place for both simple and complex tracks (hills, lowlands, and mountains). Being a district of Hoa Binh (Hoà Bình) province in the northwest area of Vietnam, Mai Chau (Mai Châu) when being seen from the high above, is surrounded by a stilt houses of the ethnic minority groups and a green valley. Here, there are two ethnic minority groups, which are White Thai (Thái) and Black Thai (Thái), making up the largest popular in the place. There is good service availability for trekking enthusiasts. Cao Bang is a province located in the northwest area of Vietnam sharing the borders with Tuyen Quang (Tuyên Quang), Ha Giang (Hà Giang), Bac Kan (Bắc Kạn), Cao Bang (Cao Bằng) and Lang Son (Lạng Sơn). It is an ideal trekking spot with the high mountains twisted with streams, rivers as well as untouched jungles. Here, you will be able to contemplate Ban Gioc (Bản Giốc) waterfall which is on the border with China and also a renowned nature feature in this province. 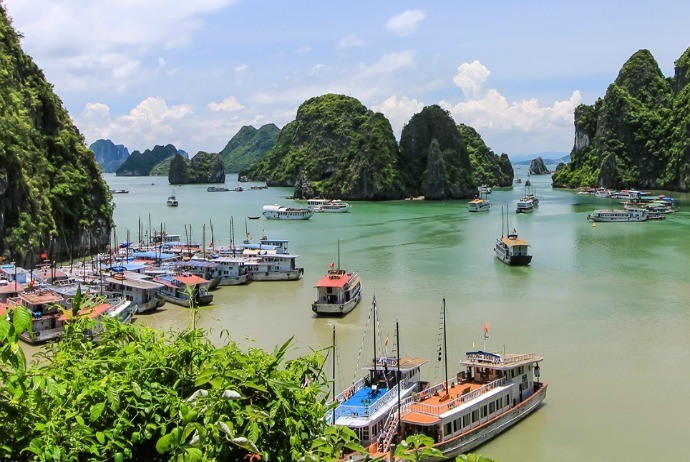 Located on the southern edge of the famous Ha Long (Hạ Long) Bay, Cat Ba (Cát Bà) Island is the largest among 366 islands comprising Cat Ba Archipelago, in which half of the area is covered by the national park. This island is the point where jungle and ocean meat one another, creating a diverse of natural ecosystems, both terrestrial and marine, leading to high rates of biodiversity. 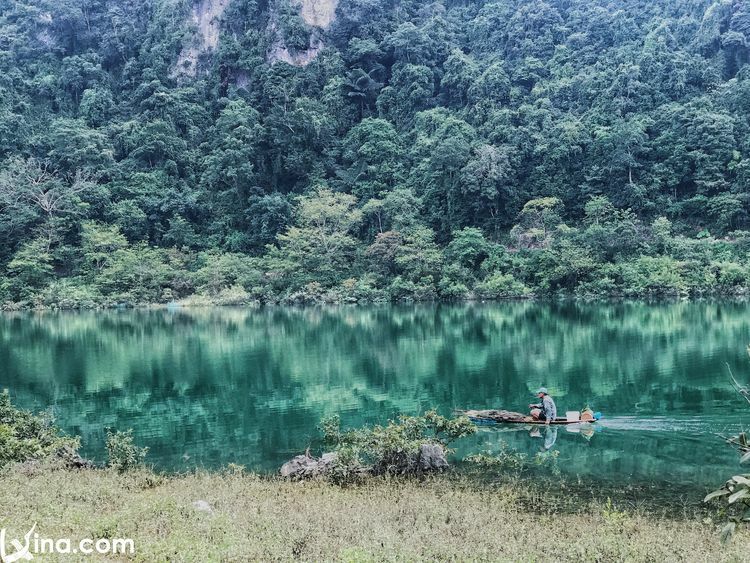 Another ideal destination for trekking in Vietnam is Ba Be Lake. This is the largest natural lake in Vietnam and now it is the centerpiece of the enormous National park. Ba Be Lake lies right in the middle of the limestone mountain range belonged to Bac Kan Province. The lake area has many things to offer, such as rivers, waterfalls, valleys, caves, and lakes which set a picturesque landscape. The area is forested intensely and home of a number of ethnic minorities. There are tropical plus with semi-tropical evergreen monsoon forests covering this national park. Built in 1962, Cuc Phuong National Park is considered the oldest in Vietnam, with the total area of 25,000 hectares and 140 km far away from the south of the capital Hanoi. This forest has remarkable botanical richness because it is the home to a large quantity of flora species and patches of the primeval forest having ancient trees with the thick root clusters, and ligneous creepers and parasitic plants. This national park is located across three provinces Lam Dong, Dong Nai and Binh Thuan belonged to the south area of Vietnam. This national park is well-reserved with the great biodiversity comprising of a large number of ancient trees living for thousand years. The system of rivers, waterfalls are stunningly striking. When it comes to geological features, the Central Highlands of Vietnam (also known in Vietnamese as Tay Nguyen (Tây Nguyên) are distinctively, contrast to the south area with an arid climate as well as rolling hills. Much of the area is an array of flat plateaus, majorly settled by different ethnic groups. Not to mention Dalat (Đà Lạt), the majority of the attractions and sights here are not introduced much in travel books, majorly because they are situated too far from the regular tourism routes. 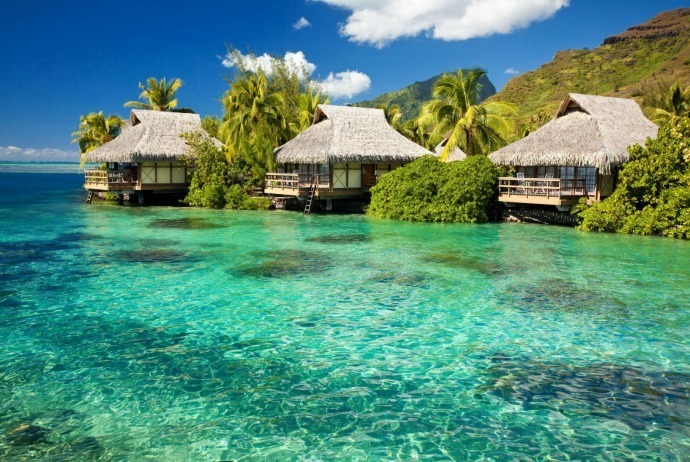 Some must-see destinations are Chu Mon Ray jungle, Ngoc Linh Mountain, Dak To hot spring, and so on. 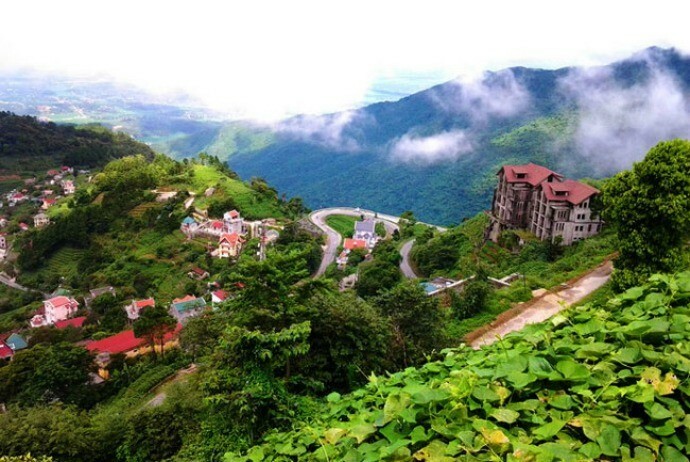 It takes approximately 15km from Sapa to reach Hoang Lien National Park. Here, the highest mountain of Vietnam – Fansipan with the height of 3143 meters – is located in. There are over 2000 species of plants developing in this national park. It is reckoned as an ideal place for trekking and ecotourism and also one of the most crucial forested regions in the northern area of Vietnam. There are many ethnic Hmong groups living here. In the rainy season, it is necessary to pay attention to bad terrain there, such as mud and landslides. Located in Ha Giang, the northern province of Vietnam which shares the borderline with China to the north, Dong Van Karst Global Geopark is at the average altitude of 1400 to 1600 meters above the sea level and 80% of the area are has limestone. Many fossils of 400 to 600 years old are also found here. The average temperature ranges from 24 to 28°C with the temperature in winter of about 5°C. There are about 17 ethnic minority groups and it is considered about the first global geopark available in Vietnam. It is really an interesting newly found route for trekking in Vietnam. There are many beautiful types of scenery on both the land and sea in Bai Tu Long National Park, which is located in the northeastern area of Halong Bay. It is about 30km to the east of Halong Bay, so it seems to be the less frequented tourist destination. With 61.25 km2 of land area and 96.58 km2 of water area, this national park has about 672 species of the terrestrial plants plus with 178 species of aquatic flowers, in addition to 170 species of terrestrial animals, 132 species of invertebrates and 119 species of fish. 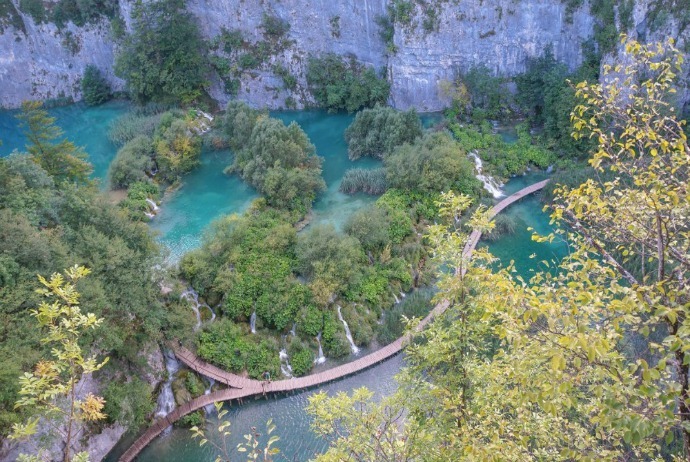 It is surrounded by enormous limestone mountains. Also considered as the commercial Van Don port, this is a crucial archaeological site of the ancient Vietnam and now is a great site for trekking in Vietnam. 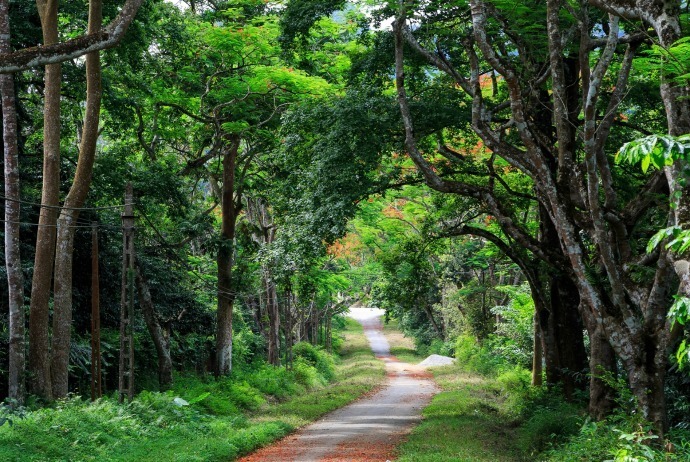 It is the smallest national park located about 70km west of the capital Hanoi. There is a mountain, about 1200 meters above the sea level, considering as the major point of the national park. Trekking lovers can reach this mountain on foot or by motorbikes (the distance is about 12km). On the weekends, this is the frequent destination for Hanoi residents to visit. It is very easily for tourists to access Tam Dao National Park from Hanoi. Located in Vinh Phuc (Vĩnh Phúc) province, the park combines the tropical forests and tropical rainforests in Southeast Asia. The highest peak of this park is Tam Dao North, which is about 1592 meters above the sea level, aside from over 20 other peaks with the altitude of above 1000 meters. It is estimated that more than 70% of the area of the park is covered with natural as well as artificial forests. Over 2,000 species of plants are growing here with 904 species beneficial for the human health. It is a perfect place to visit for those tourists traveling from Hanoi to the southern area of Vietnam. Considered as the most important places for mammal protection of Vietnam, Pu Mat Nature Reserve has high biodiversity and is a great place for eco-tourism with the densely forested region. It is the area of Thai ethnic people, so there are a lot of chances for homestay. The boating possibility through this reserve is always available. There are nearly 1000 species of animals and 2500 species of plants in the reserve. 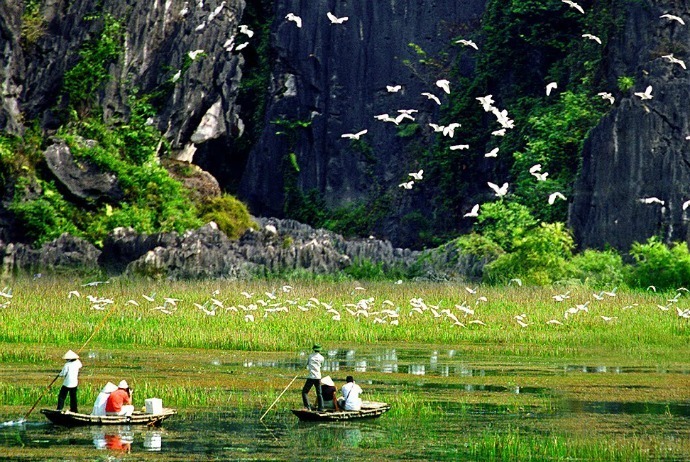 This little-known nature reserve is situated about 20 km away from Ninh Binh (Ninh Bình). If you stay longer in this town of Ninh Binh, it will be great to have a one-day trip that includes trekking and boat ride activities. The area is similar to Tam Coc and Trang An. Being a park in Phu Tho (Phú Thọ) Province, about 100 km west away from Hanoi, this national park has about 365 animal species, including gibbon, bear, langur, pheasant, leopard, etc. The area also has many caves with the longest of about 6km in length. About 84% o the area is densely covered by forests. Xuan Son National Park is rich in flora and fauna. Tourists trekking here can stay in the houses of ethnic minorities such as Dao and Hmong. What Is The Best Time For Trekking In Vietnam? When it comes to trekking, the best time for this activity is the dry season, from October to May. During this season, several months seem to stand out as more ideal options than the others, with March and April having warmer temperatures, little rain and spring blooms. In October and November, you will experience rather stable climatic conditions with clear blue sky, and cooler temperature. From December to February, it could be very cold. 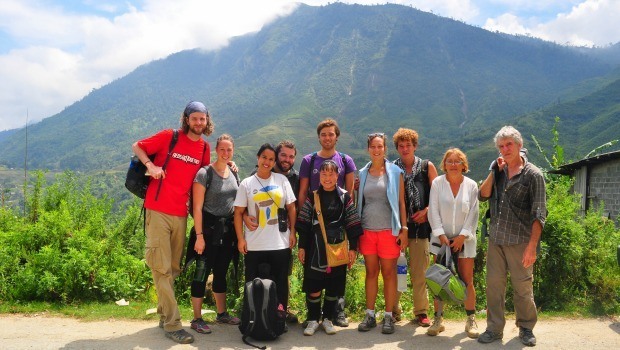 It is also the busy period for tourism, particularly in Sapa. Keep in mind that the weather at those altitudes is very changeable and it might rain at any time; hence, you had better pack accordingly. Some amount of Vietnamese Dong for shopping upon visiting markets and encountering local hawkers. Food used during trekking process which is normally canned, long-preserved, easy-to-cook and nutritious such as dried meat, dry provisions, instant noodles, vitamins, and coffee. Some junk food is handful and should be kept or stored in the most accessible section of the backpack. MP3 player, the map of the area for trekking, a GPS navigation device to help solve the cases of getting lost. A mini set of helpful tools such as a pair of pincers, can-openers, a set of needle, and scissors. Trekking in group is great, because people could easily help each other if there are problems, particularly upon crossing the stream, river, or in some dangerous areas of the roads; thus, exploring the jungle alone is not a good idea. Avoid drinking water or consume things that could be found within the forest to prevent poisons. Tourists should buy fresh food or have meals with local people. Carefully research official maps and the area terrain of the trekking, estimate the distance, and watch the weather forecast to prepare your best for the journey. Do not forget your identity card as well as permission paper upon trekking to the border’s area along with natural reserves.